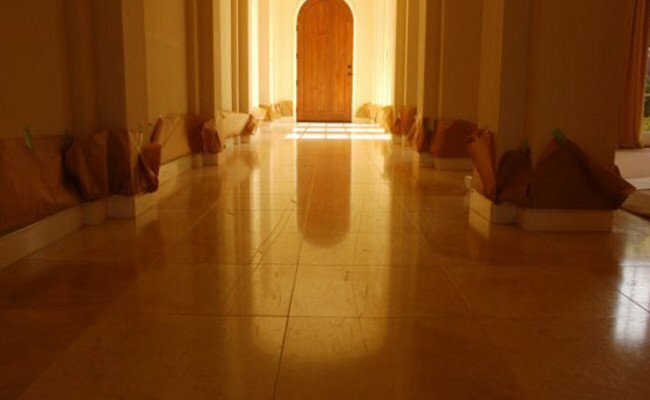 Our clients purchased a home with a beautiful travertine floor. Unfortunately this new homeowners did not realize that the shine of the travertine floor, which had been coated with a topical sealer, would become diminished. Topical sealers become worn over time with scuffs, scratches, and ground-in dirt from regular foot traffic. Our first step was to strip the travertine floor to completely remove the old, yellowed sealer. Then, we honed the floor. The travertine honing process revealed the brand new stone underneath. After we thoroughly cleaned the dirt and grime from the porous grout lines, we applied a sealer to fill in the grout pores. This ensured that the homeowner could more easily maintain the appearance of the floor with regular cleaning. The floor looked so clean and brand new, that the homeowners decided to repaint the walls to achieve an overall fresh, attractive look. As you can see, there’s a dramatic difference. The homeowners, stunned by the beauty of the floor, said that it was best investment they had made. Are your floors scratched and worn-looking? Perhaps this is due to an old application of topical sealer. 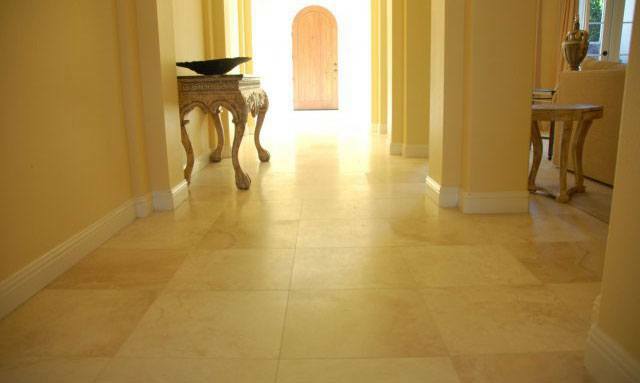 Contact us online or call 619-246-0240 today to discuss your natural stone restoration options.